Say It One Time for the Brokenhearted was the first of many titles by renowned UK music journalist Barney Hoskyns. Thirty years after its publication he revisited the modern-day classic for this revised and expanded anniversary edition that marks the book's first publication in the US. 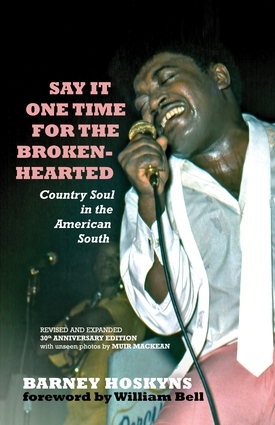 Fascinated by the collision of country and soul music in the Southern states, Hoskyns and photographer Muir MacKean set out on a journey through the American South to explore the phenomenon of primarily black singers and primarily white musicians joining forces in the 1960s to create musical magic in an era of racial tension. From Memphis to Muscle Shoals to Nashville, they sat down with dozens of the architects of what's come to be known as Country Soul to capture a story that is as inspiring as it is historically important. Barney Hoskyns is the co-founder and editorial director of Rock's Backpages, and the author of several books including "Across the Great Divide," "Waiting for the Sun," "Hotel California," "Lowside of the Road," and "Small Town Talk." A former US correspondent for MOJO magazine, Hoskyns has written for numerous publications, including Vogue, Uncut, Spin, Rolling Stone, GQ, and others. William Bell is a Stax Records recording artist and a legend of Southern soul. The GRAMMY-winning singer/songwriter is responsible for such classics as "You Don't Miss Your Water (Until Your Well Runs Dry)," "Born Under a Bad Sign," "Everybody Loves a Winner," and "I Forgot to be Your Lover."